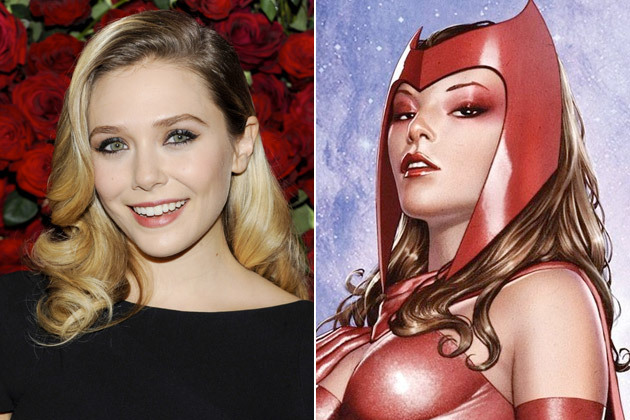 Elizabeth Olsen Officially Confirmed as Scarlet Witch in "Avengers: Age of Ultron"
When big name movies come around, the next step is always big name casting rumors, from Star Wars, to Avengers, to Star Trek, etc. "I don’t think we begin shooting before March of next year. I know we're shooting in London, that James Spader is Ultron and going to be the bad guy, and that we added Ms. [Elizabeth] Olsen [who will play the Scarlet Witch], but I don’t know what she’s doing, if she’s on the inside or the outside. I haven't seen a script." As suspected, the internet exploded with rumors, "confirmations", and everything one could possibly think of. However, Olsen has officially come out and confirmed that she is, in fact, playing Scarlet Witch in "Avengers: Age of Ultron". "It's so fun," she told the site, adding that she looked forward to collaborating again with her co-star in the "Godzilla" reboot, Aaron Taylor-Johnson, who'll play her twin brother, Quicksilver, in "Avengers." "Avengers: Age of Ultron" comes out May 1st 2015.